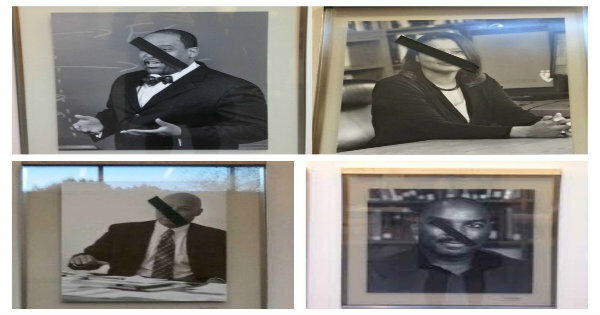 Yesterday, I learned through a college friend that portraits of African-American professors at Harvard Law School were vandalized several days ago. The faces of professors were marred and crossed out with black tape. In a matter of seconds I bulleted from shock to rage. How could this happen here? In 2015? At Harvard? Don’t we know better? Then my own Harvard history intervened. Being an activist undergrad in the mid-80s, I, with other students, petitioned and urged Harvard College to have more minority professors. We wanted more people “up there at the podium” who looked like us. We wanted to feel a greater sense of belonging in a community where it was clear we were not the raison d’etre. In the end, I think we just wanted to know that we mattered. Thirty years later, we have enough African-American professors for whom portraits can be displayed on the walls of Harvard Law School. The road to the wall of portraits was not easily traversed and still isn’t. Many had to prevail against the winds of history to urge this new reality into being. And it seems, some are not thrilled with our new history. I could have stayed in anger and outrage and retaliation. Let’s DO SOMETHING to punish these “bad” people. Clearly they were wrong. Justice needs to be served. But years of meditation prompted me to simply pause before I ranted on toward my righteousness and justice. And when I did, what emerged were tears. Sadness. Hurt. Heartfelt pain for those professors who were so publicly violated. For the efforts my classmates and I made during our years as undergrads. For my African-American mother-in-law who lived her whole life feeling marginalized no matter how educated or well-dressed she was. For my coaching clients, many of whom still live daily, feeling like outsiders, yearning to fully belong in their workplace and institutions. For the black men and women we’ve seen in the media hurt at the hands of those who should protect them. For Paris and the Bataclan. For the collective fear and sadness so many of us are enduring in this world. The interesting thing is that when I could go into my hurt, sadness and vulnerability, (rather than stay in my rage), I had space to consider a wider array of thoughts about the incident. I felt my compassion for the professors, my clients, victims of violence. But more interestingly, I opened up enough space for curiosity. I dared to not be right and instead opened myself to ask why someone would do such a thing? Why would someone risk being caught defacing these portraits at the esteemed Harvard Law School? What emotion would drive someone or some people to do such a thing? It surely didn’t seem like an act taken on by raucous individuals out to have some fun. Underlying such an act was anger. As I’ve learned, anger is always the cover for some deep vulnerability and fear. So I ask, what did this individual or individuals fear? This morning, I read in the Harvard Gazette that tape was put across the professors’ portraits after African-American students had put tape across the seal of Harvard Law School, which is the coat of arms of Isaac Royall, Jr, a slaveowner and whose funds helped to establish Harvard Law School (as many may know, students across the US are questioning universities whose identity is affiliated with funders who had been slaveowners). It helped me realize that the portrait vandalism was a reaction to what was done to the HLS seal. Clearly the person(s) felt the ire to respond. The portrait perpetrators weren’t annoyed, they were ENRAGED. In this moment, I have only one response. Compassion. Compassion for all involved and affected. We must open ourselves to a possibility beyond a clear right or wrong. We have to go beyond believing that a punitive measure will address the real issue. What we need is authentic understanding of each other. It’s taken me a long time to really understand compassion. We often deem compassion to be a sign of weakness and compromise. But I’ve come to learn that it takes incredible inner courage and strength to exercise compassion. Compassion, I’ve learned, is the gateway to radical perspectives that can enable understanding and peace. If we stay open, we can see that acute, violative actions usually belie a strong emotional undercurrent. To understand these strong undercurrents requires us to suspend judgment long enough to witness the complexity of ambiguity, knowing that the answer may not be found in a linear, measured way. We have the opportunity to recognize that actions of violation are the symptom of a strongly held emotion. If we are to solve the symptom, the action of violation, we must offer space for the driving emotion to emerge so we can work at the true cause. Our deepest emotions will honestly surface only when there is safety. If we are to come together and live together with people of difference, in peace and acceptance, then we must create a safe space in which we get to know each other. The knowing is not perfunctory. The knowing is about true understanding, even at our very worst, in the hopes that this process of mutuality will lead us to a place of common goodness.